Roger Ebert: After due homage has been paid to every other heist movie ever made, the movie springs to life, briefly. McQueen and MacGraw find themselves running several seconds behind schedule, so that the diversionary explosions occur ahead of them, instead of behind them. Whoops. Why the diversionary explosions were set to go off after the bank job instead of before it is never, alas, quite explained. It is also not explained why it was necessary to purchase a truck and load it with hay in order for Ali MacGraw to hide a bomb in the hay. Why hay? Why a truck? Why not be cheap and purchase a garbage can? Anyway, the movie is about half over by this point, and we're still waiting for Peckinpah to rise to the occasion. He does, at last. There's a neat scene where Ali tries to put the briefcase with the loot into a locker at a railway station. A con man switches keys on her and gets the loot. McQueen follows him onto a train, and there's a chase through the crowded aisles that would please even a Hitchcock. NYTimes: In concentrated bursts, “The Getaway” occasionally comes to vivid, melodramatic life, as in a sequence in which McQueen hunts down a small‐time thief who has stolen his valise containing $500,000, probably under the notion that it contains some hockable jewelry or traveler's checks. A subplot (actually more interesting than the main plot) details the easy decline and fall into whoredom of a veterinarian's dim‐witted wife (enthusiastically played by Sally Struthers of “All in the Family”), when she and her husband are kidnapped by one of the bank robbers. Senses of Cinema: Seen now, The Getaway is more interesting as one of the early prototypes of the modern US action film, following from the headwaters (Dirty Harry, 1971): clean-lined, built for speed, self-effacing but an intricately worked object nonetheless. It was a product of Hollywood’s then-booming independent sector, in this case a production company controlled by the film’s star. This hints at one of the problems the project holds for Peckinpah: Steve McQueen is too obdurate and self-contained an actor to fit easily into Peckinpah’s preferred ensemble method – although even in this Scandinavian-furniture, streamlined concept film, the director manages to stuff members of his baroque stock company into the cracks (providing Peckinpah’s cherished redneck comedy are Slim Pickens, Bo Hopkins, Dub Taylor and Roy Jensen). 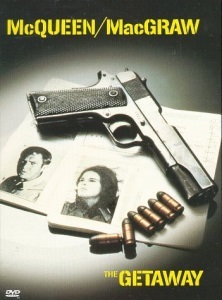 Although too early for a Walter Murch-style “Sound Design” credit, the soundtrack work is complex and sophisticated: beyond jazz veteran Quincy Jones’ score lies elaborate use of sound-as-music as well as sharp punctuation – observe the interplay and progression of images and sounds in the opening sequence, one of the most impressive passages in the film. Whenever possible, events are presented kinetically, that is, for maximum visceral effect (The Getaway is not a reflective film; it doesn’t have time to be). Another site of interest is the script. Adapted from one of Jim Thompson’s novels , screenwriter Hill discards most of the novel’s interesting but difficult aspects – the psychological portrait of the hero, Doc; the quirky, complicated deployment of characterising details; the imperceptible slide into a surreal world of symbols; and a ghastly black humour ending. With what remains, he fashions a concept-film script exactly as spare as that of Reservoir Dogs (1992) – situation: a bank job gone wrong; imperative: the central couple need to escape the pursuing assassins; complicating problem: Doc’s reactions to Carol’s necessary infidelity. An extremely mean antagonist is provided (Al Lettieri here, reprised in Mr Majestyk ; Michael Madsen in the 1994 reconstruction). With a minimum of characters, Hill works out a geometry of parallel actions and scenes as the central section of the film, particularly effective when Lettieri and his hostage/lover Sally Struthers cartoon the jealousy/adultery theme complicating Doc and Carol’s life. The opening sequence is brilliant. The fantasy sequence by the lake after release is brilliant. But the film is so oddly constructed after that, I don’t even remember the Hitchcockian chase on a train (I barely remember a gleefully evil Sally Struthers). An interesting failure? Ends with Slim Pickens in his usual fine form >> 5 starts.